This month’s RPG Blog Carnival, hosted by Dice Monkey, is all about celebrating the RPG Blogging Community. What better way to do that than to celebrate the Roleplaying Tips community-created product 650 City Encounter Hooks and the associated City Encounter Hook Generator. In 2010, Roleplaying Tips celebrated 500 issues with a massive contest aimed at gathering 500 interesting city encounter hooks. Thanks to the creativity of RPT subscribers, we smashed that goal and received over 720 entries. After editing and removing some duplicate entries, we ended up with a final batch of 650. This massive list of city encounter hooks was compiled into a free PDF, which was distributed for free to subscribers of the Roleplaying Tips Newsletter, many of whom had contributed to the contents. This freebie is still given out as free product to subscribers to this day. 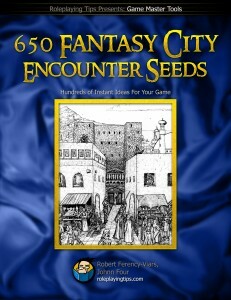 In addition to the free PDF offering hundreds of ideas for urban campaigns and settings to keep PCs nervous, wary and excited, as they should be, Roleplaying Tips would offer even more value to the community – access to an online City Encounter Hook Generator, which contains all 650 of the encounter hooks supplied in the PDF. This made the Roleplaying Tips Community City Encounter Hook Generator the ideal resource to inspire your plotting, or for instant inspiration during a game when the characters do something unexpected. So, what sort of hooks does the Roleplaying Tips Community City Hook Generator create? Well, here are just 10 of the hooks generated by a single use of the generator. There is but one accepted religion in town. What about the party cleric who serves what is here deemed a false god? Every NPC the PCs encounter seems to recognize one or all the PCs as a relative to one of the high ranking nobles. The nobles can be good and NPCs expect handouts, or the nobles can be bad and NPCs shrink away as the PCs walk about town. A group of laborers is having a loud argument with the person who hired them. They demand back-wages, while the person who hired them complains about their shoddy workmanship. Both parties stand in the middle of the street, making passage impossible. An upset librarian seeks a group of adventures to get a book returned to him. Doesn’t seem like a big deal until the librarian tells the group the book was taken by an insane wizard who was mumbling something about raising an undead army. The book: How To Bring The Dead Back To Life. One of the city wells has dried up. As the PCs pass the well, they can hear a scrabbling sound coming from inside it. A small infant monster climbs into the PCs’ wagon/saddlebag/backpack to hide from the town guard, who are hunting it down to kill it. When discovered, it befriends the PC and calls them mama. A character twists his ankle on the city cobblestones. While treating the injury, which will not yield to traditional cleric ministrations due to an unfortunate allergy, the chirurgeon attempts to apply the virus of an incurable infection. When detected, he uses a Cloak of Darkness to escape and leads the party into a hostile mob. After tracking a pickpocket down, the PCs find he is a member of a gang of runaway and homeless children run by fear and intimidation by a high ranking member of the ruling class. Do the PCs help the children or do they leave them to their fate. The end of the world is nigh! People in the entire region are flocking to the temples because of a large, bright omen in the sky. Priests, monks and religious persons offer conversions and religious services around the clock as swarms of people wish to redeem their souls for the afterlife. The massive fireball in the sky inspires panic in everyone, even royalty, who are giving large sums of money to have their souls saved first. The PCs investigate and stumble on some interesting facts: 1) people before this omen were not that religious, temples were visited rarely; 2) priests were barely making ends meet; 3) the fireball does not move; 4) the fireball just appeared one night, and at about the same time all the priests, monks and religious people started preaching the end of the world. The PCs find a large structure, possibly afloat (like a big balloon), that holds the fireball. The plan was devised by all the religious factions to help bolster their flocks, faith, free labour, and of course, monetary donations to the churches. The plan is that, in a month, the object will disappear, the people saved by their religious turnabout, and donations will have to be kept up lest the object return again due to their lack of faith. As you can see, this sample contains a wide range of different hooks, each one just brimming in potential adventure for PCs who decide to follow them up. Thanks to all the Roleplaying Tips readers who sent in such great ideas! We have more contests and community ebook compilations planned in the future. A game master can never have enough tools in his toolbox, right? Right now, fantasy urban campaigns are Johnn’s favourite setting. He just concluded his two year Riddleport city game with an epic finish. Now he’s planning another city setting. There are just so many gameplay opportunities. You get faction play, intrigue, politics, and a ton of NPCs. You can also add in dungeon and wilderness encounters anytime. ?We hope you get good use out of the free ebook and online generator for Roleplaying Tips readers, created by the Roleplaying Tips Community. The Roleplaying Tips newsletter continues to help game masters have more fun at every game. You can receive the tips at no cost at the website. You will also be able to enter future contests and make tip requests to specifically help your game. Johnn has written three other books perfect for GMs running city adventures. These do more than give you bullet lists of ideas. They actually teach you how to become a better GM by providing specific GM advice, how-to’s and tutorials. If you can master the design of memorable urban NPCs, iconic civic holidays, and classic inns, taverns, and restaurants, you will have the tools at your beck and call to create great city gaming. Lists of ideas are good in a pinch, but once you learn how to design key game elements, you will have full control to bring your campaigns to life. It won’t matter if you are planning alone or if you are at the table in the heat of a session, your new design skills will give you the tools to create and run excellent city encounters. Have more fun at every game! 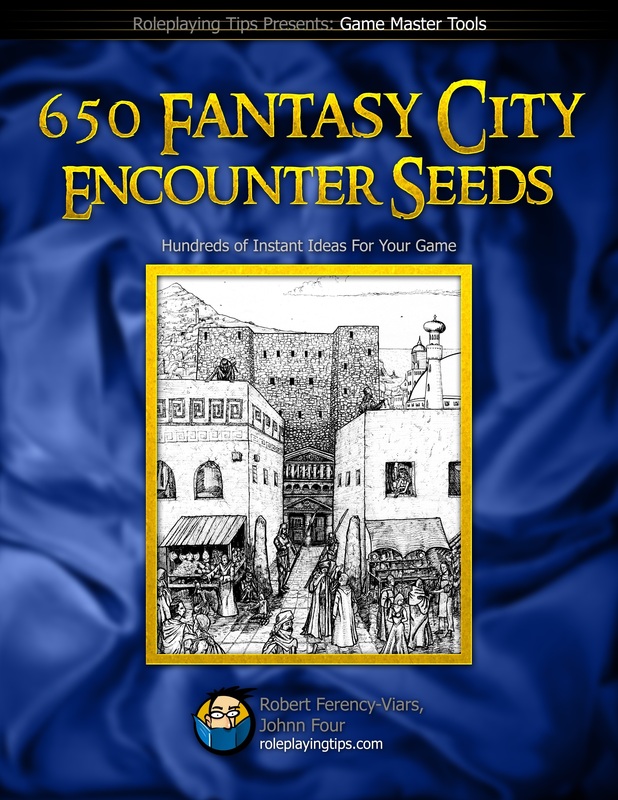 Subscribe to the newsletter and become part of the massive Roleplaying Tips Community today (and get your copy of the 650 Fantasy City Encounter Hooks PDF as a bonus).